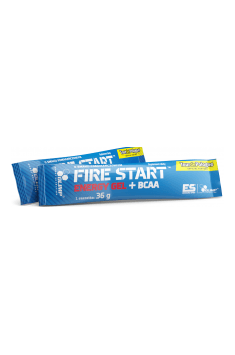 OlimpFireStart Energy Gel + BCAA is a high quality supplement in the form of energy gel which is a source of quickly absorbed energy and microelements, vital to normal muscle function during demanding training sessions. What is more, it comprises branched-chain amino acids which show strong anticatabolic properties and provide protection of the muscle tissue. The product does not leave a bad aftertaste and does not cause discomfort. Convenient packaging allows you to consume it easily during workouts. Vitamin B1, otherwise known as thiamine, is a vitamin vital to the body which is involved in the coordination of metabolic processes. Owing to it, lactate, which is responsible for muscle soreness, is removed effectively by the body. This results in a reduction in pain and also increase in muscle efficiency. Furthermore, is associated with enhanced processes of production of ATP, a molecule which is a carrier of intracellular energy utilised for, among others, muscle function. Both effects mentioned above contribute to a significant increase in endurance during training sessions. Potassium – an important microelement which is found in our body cells and regulates the function of many systems along with sodium. Normal concentrations of potassium cations are necessary for maintaining homeostasis of the nervous system because it is involved in neurotransmission and thus facilitates normal function of, among others, neuromuscular junction, which is necessary for the function of muscles and their constant growth. The heart, commonly called “the engine of the body” is another organ that is largely dependent on potassium ions. Their deficiency leads to dysfunction of the “pump”. As a result, our muscles are not provided with sufficient amounts of oxygenated blood with essential nutrients without which their effective function is impossible. Magnesium is the next electrolyte which acts on the neuromuscular junction. However, its main task consists in the inhibition of excessive muscle stimulation. At the molecular levels, magnesium competes with calcium – the latter initates contraction and its excessive amounts may result in popular calf muscle cramps both during physical activity and rest. Consuming magnesium is effective in this condition because it reduces harmful effects of calcium and cramps subside. Like thiamine, magnesium is one of the microelements which help produce metabolic energy in cells. This energy is used during training and thus increases endurance and allows you to build continuously muscle tissue. Citrate, the organic form of magnesium in this preparation, is the best absorbed form on the market and is much more effective than popular supplements based on carbonate forms. Sodium, a cation of extracellular fluid, is involved in maintaining normal blood plasma volume and cell hydration and thus water-electrolyte balance. In addition, it regulates nervous system function. Its deficiency is manifested by impaired transmission both in peripheral nerves and central nervous system pathways. This result in poor muscle strength and in extreme cases disorders of consciousness. Its careful supplementation, along with adequate fluid intake, is extremely important to athletes. As an electrolyte, it has therefore the greatest impact on blood pressure and is consequently critical to normal perfusion of organs and tissues vital to athletes. Taurine is a non-specific amino acid that does not build muscle proteins, but it is mainly involved in the body’s detoxification processes in which toxins are excreted with bile acids conjugated with taurine. Interestingly, this molecule helps also stabilise blood sugar levels and thus prevents drops in energy levels, which may be dangerous especially during hard workouts when glucose is burned rapidly as an energy source for muscles. This lifts your mood and leads to higher motivation and focus before and during training sessions. BCAAs, whose full name is branched-chain amino acids, is a group of three amino acids (leucine, isoleucine and valine) whose chemical structure, in comparison with other amino acids, resembles “branches”, hence their name. They belong to a larger group of essential amino acids (EAAs), namely those which are necessary for building, among others, muscle tissue but cannot be synthesised in our body and must be provided from external sources (food). The most important BCAA is leucine, which has a useful property as it can activate protein biosynthesis, the most important process for muscle tissue which leads to the formation of new, stronger fibres. Because of that, BCAAs are a useful ingredient which will allow you to provide muscles with essential amino acids that will prevent protein catabolism during hard workouts. To sum up, Olimp FireStart Energy Gel + BCAA is a high-quality energy gel prepared for the most demanding athletes who value comfort of use and opportunity to recharge their batteries quickly to do hard and effective workouts. Take a maximum of 4 sachets daily - use 1 sachet at regular intervals during exercise. Shake before use. Consume immediately after opening. The supplement is designed for all individuals training hard who want to increase their performance by providing a quick and alternative source of energy during training sessions. The addition of electrolytes and vitamins allows muscle tissue to use energy substrates even more effectively and maintains the homeostasis of the whole body. I recommend also to take caffeine which will give a stimulant effect before training and help enhance focus during a workout. 41% maltodextrin, water, 20.5% fructose, acidity regulator - citric acid, flavors, lecithin emulsifier (from soy), preservative - sorbic acid.